India is sitting on the diplomatic fence, signing an arms deal with Israel and reaffirming a "strong commitment" to the PA cause. India continued to play both sides of the diplomatic fence this week, signing a huge arms deal with Israel, while reaffirming its "strong commitment" to the PA cause. Israel Aerospace Industries Ltd. announced Wednesday in a notice to the Tel Aviv Stock Exchange (TASE) that it had signed a four-year contract for the sale of $1.1 billion in military equipment, without naming the customer. India has for years been one of Israel's major military customers, and the country has already purchased the Barak ground-based and ship defense missiles from IAI. According to the Globes business news agency, India was indeed the customer with whom IAI CEO Yitzchak Nissan closed the deal. The information could not be independently confirmed. India, however, also made sure to reach out to the top leadership in the Palestinian Authority on the same day. The country's External Affairs Minister S.M. Krishna held meetings in Ramallah with PA Chairman Mahmoud Abbas, Prime Minister Salam Fayyad and his PA counterpart, Fiyad al-Malki. 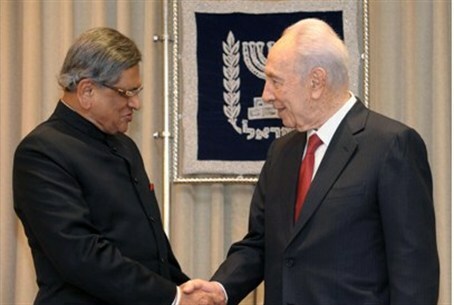 Krishna reassured the PA that India maintains a "strong commitment" to the Palestinian cause. The Indian minister arrived Monday in Israel on a mission to strengthen bilateral ties between his country and the Jewish State, the first visit to Israel by an Indian foreign minister in more than a decade.